We are very excited to announce that our perfect partnership for composite wood is now available to purchase directly from us on our website. 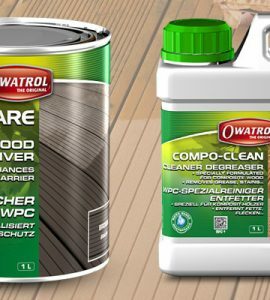 Owatrol produce two products designed specifically for use on composite wood and they complement each other perfectly. When used in tandem they can revive even the most sad looking composite decking, garden furniture or pool surround! Compo-Clean is our water-based cleaner and degreaser which is suitable for use on all exterior composite wood surfaces. It won’t attack pool liners, stone, cement or other nearby surfaces and it’s kind to the environment too with no solvents or paraffin. It’s super easy to use, just pour straight from the container and apply with a brush or roller. It works in just 5 minutes and can simply be rinsed with water from a hose or pressure washer. Compo-Clean has a convenient gel consistency so you can use it easily on vertical surfaces like the sides of your hot tub, or the balustrade round your deck and it won’t drip! Compo-Care does exactly what its name suggests – it cares for your composite wood! It is a water-based coating designed specifically for reviving all types of exterior composite wood. It creates a waterproof protection for the surface whilst also protecting it from stains. Compo-Care gives a matte-matte sheen finish and is a transparent tinted coating. This great little product only needs a single coat and can make such a huge difference to the appearance of your composite decking, garden furniture, hot tub, swimming pool surround and more! If you’ve used Owatrol products on your composite wood surfaces we’d love to hear from you – and if you can send us a picture or two as well that’d be even better! Don’t forget, you can also leave us a review when you’ve tried our products – you can do this on the product pages.